As more information regarding a secret Internet data mining initiative comes to light, one report reveals Apple staved off advances from both the NSA and FBI until six months after cofounder Steve Jobs died, though the company claims not to have even heard of the program. Update: CNBC is now reporting Facebook and Google are also denying involvement. Update 2: Yahoo has also released a statement denying participation in PRISM. The Washington Post on Thursday dropped a bombshell when it published a report outlining a formerly secret government project  codename PRISM  that monitors the central servers of nine major U.S. Internet companies, the most recent being Apple. According to the report, which is based on leaked PowerPoint slides, Microsoft, Yahoo, Google, Facebook, PalTalk, AOL, Skype, YouTube and Apple are participating in the project that "extract[s] audio, video, photographs, e-mails, documents and connection logs that enable analysts to track a persons movements and contacts over time." Apple reportedly joined PRISM in 2012, some five years after Microsoft became the first corporate entity to take part in the program. Others followed suit, offering the FBIs Data Intercept Technology Unit access to their servers. The publication claims the Silicon Valley companies were "obliged" to accept a directive from the attorney general and the director of national intelligence, possibly as part of a secret order handed down by the Foreign Surveillance Intelligence Court in 2008 to "compel a reluctant company 'to comply.'" PRISM is reportedly one of the main sources of the President's Daily Brief, being cited in 1,477 articles during 2012. 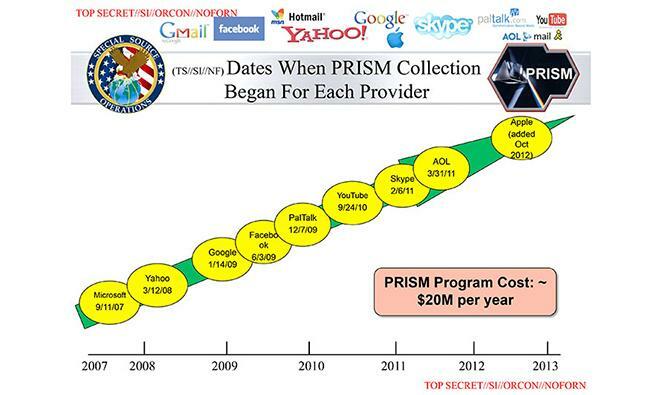 One of the slides notes NSA reporting increasingly relies on PRISM for data acquisition. not provide any government agency with direct access to our servers." A more extensive and in-depth report on the operation and its long history can be found on The Post's website.